We celebrate America's most innovative historic production car, the Chevrolet Corvair! To access the pages that make up this site, please click on the hot links at the top of this page. NJACE is one of the many regional chapters of the Corvair Society of America (CORSA), a non-profit organization that was incorporated to satisfy the common needs of individuals interested in the preservation, restoration, and operation of the Chevrolet Corvair. NJACE caters to Corvair people who live between the Hudson River and the Delaware River in the northern half of New Jersey. But our members reside all across the country, from New York State to Florida to California. 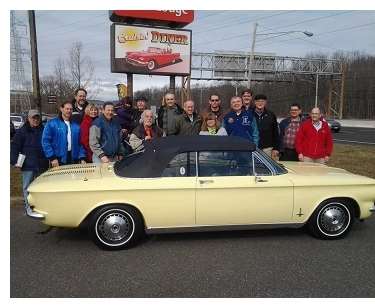 We have Corvair tech sessions, social events, parts auctions, road tours and more. This is a very special car club! NJACE Breakfast Give Away !!! NJACE meets the first Saturday of every month for breakfast. Following the breakfast, we have a drawing and the winner gets his or her choice of a gift certificate from Clark's Corvair Parts or having his or her breakfast check picked up by the club! A second name is then drawn and the winner of the second drawing receives the remaining prize. YOU could win this month. All you need to do to be eligible is to be a member in good standing and be among those in attendance. So, get out on the first Saturday of the month and enjoy a hearty breakfast with NJACE. See our "Calendar" page for the date, time and location of the next NJACE breakfast meeting! The Chevy Corvair! Coolant-free engine, four wheel independent suspension, unit body construction, plenty of passenger space, balanced braking, light steering, low center of gravity and more. Rear-engine design was the key to the concept! During the 1950s, Chevrolet's Vice President of Engineering, Ed Cole, dreamed that America could mass produce a series of small economical cars and trucks brimming with great features, like coolant-free engines, four wheel independent suspension, unit body construction, plenty of passenger space, balanced braking, light steering, low center of gravity and more. Rear-engine design was the key to the concept. Against all odds, Ed Cole gained approval for his dream car, and the Chevrolet Corvair was born. General Motors produced 1.8 million Corvair cars and trucks world-wide from October 1959 to May 1969. Corvair - The most innovative cars and trucks ever produced in America! Click HERE to go back to the NJACE Home Page.